a long time. Cherries are just a part of our agricultural history. So much so, that we have "Cherry" everything around here. 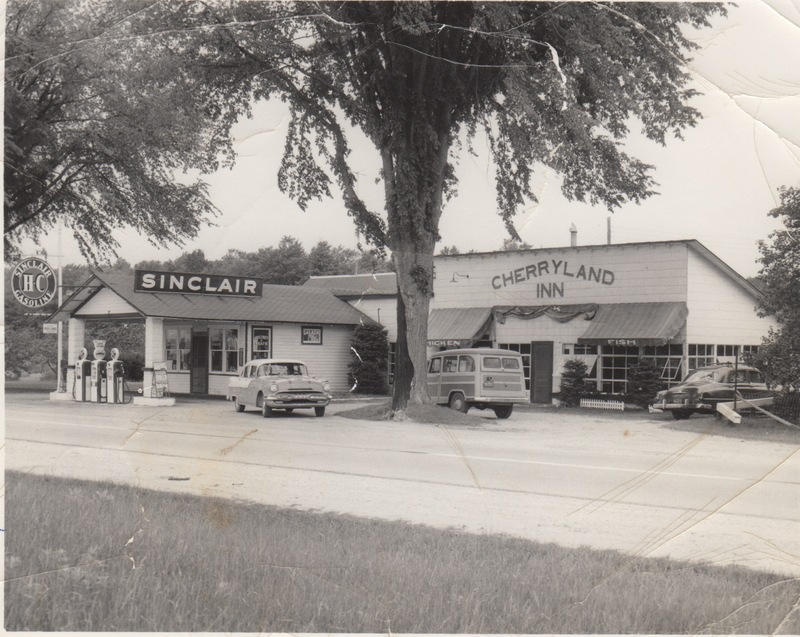 On the right is a picture of the Cherryland Inn, and next to it is Nick's grandfather's grocery store called, you guessed it, Cherryland Grocery. Wow, was this foreshadowing? Now Nick and Jamie have their own store named after this famous fruit too. But when did it all start? It was 1852 when Peter Dougherty, a Presbyterian missionary, planted the first cherry orchard on the Old Mission Peninsula (see figure below), located in Grand Traverse Bay. Local Native American farmers had grown other fruit trees in the area and had told Dougherty not to bother. He ignored them and planted the first cherry orchard, anyway. Thank goodness for Dougherty's stubborness. The cherry trees flourished and soon other cherry orchards were planted all over Northern Michigan. Cherry trees can grow just about anywhere. However, they need specific conditions to grow to their full potential and the Grand Traverse Region possesses them. The orchards are usually planted on rolling hills and sandy soil, this condition is needed for water drainage and air flow. Lake Michigan also plays a part helping to calm the cold winter winds and keeping the orchards cool in the summer. These conditions made the Grand Traverse area excellent for growing cherries commercially. 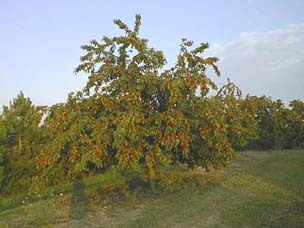 The first commercial cherry orchard was, planted near the site of Dougherty's original orchard. By the early 1900's the tart cherry industry's production had surpassed other crops produced in the area. The first cherry processing facility, Traverse City Canning Company, was built just south of Traverse City. Today, Michigan is the leading producer of tart cherries in the United States, producing 70 to 75 percent annually. Michigan usually produces 200 to 250 million pounds of tarts, depending upon many factors, including weather and the age of the trees. Trees generally start producing fruit around 7 years old and are "retired" around 20 years old. There are 36,000 acres of tart cherry trees in Michigan; about 55,000 acres nationwide. Also known as pie or sour cherries, the Grand Traverse Region produces over 50 percent of Michigan's annual tart cherry crop, or about 100 to 120 million pounds. Tart cherries are seldom sold fresh. They generally are canned or frozen shortly after harvesting. The main variety of tart cherries is called the Montmorency. It has been in the U.S. for more than a century and is best for pies, preserves, jellies, juice and other products. Another tart cherry, the Balaton, is "new" on the scene having been around in Michigan for about 20 years. It was brought over from Lake Balaton, Hungary, by Michigan State University. It is a dark tart cherry that is a bit sweeter. We use it in our Triple Cherry Pie. The Pacific states are the primary producers of sweet cherries but Michigan still ranks in the top four, producing about 20 percent of the annual crop. 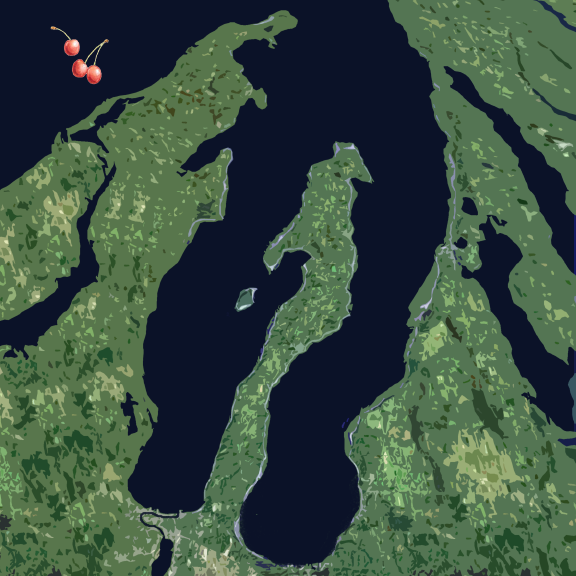 The Grand Traverse Region produces about 80 percent of Michigan's annual sweet cherry crop, or about 50 million pounds. Michigan produces these varieties of sweets; Ulster, Emperor Francis, Queen Anne, Napoleon, Hedelfingen and Schmidt. Sweets can vary greatly in color, ranging from black (Ulster) to yellow (Emperor Francis). The majority of Michigan's sweet cherry crop is processed. The main product made with sweets is maraschino cherries (typically from Emperor Francis and Queen Anne). But, while driving through Northern Michigan you can find sweet cherries at a local supermarket, farm market or roadside stand, and many are consumed during the National Cherry Festival, which is always the first full week of July.